There is more to Martin Luther King Jr. Day than a day of rest. Here are 8 lessons marketers can learn from this famous man who gave one of the most famous speeches in world history. In order to accomplish anything, you must have a dream. In marketing terms, we call that a goal. King set clear goals, outlined in this speech: “This nation will rise up and live out the true meaning of its creed: (…) That all men are created equal.”- The sons of former slaves and the sons of former slave owners will be able to sit down together at the table of brotherhood.- The State of Mississippi will be transformed into an oasis of freedom and justice.- My four little children will one day live in a nation where they will not be judged by the color of their skin, but by the content of their character.- Little black boys and black girls will be able to join hands with little white boys and white girls as sisters and brothers.These goals were measurable, testable, and provable. A marketer must do the same thing to measure his success. 2. Spend the most time on crafting your message. King wrote his speech with passion and an utter conviction that he was doing and saying the right thing. He had plenty of advisors to help him craft his message. And he believed in his message so much that he was willing to die for it.As a marketer, we need to fully believe in our message and craft it as well as we can, listening to a team of creatives that will make the message come to life. Only when we believe in our message and stand behind it can it be successful. 3. Craft your message so well that it’ll become world-famous. Martin Luther King Jr.’s speech is world-famous still today. Back in the day, it became famous because of its controversy, but also because it was so well-crafted that it was worth the controversy.Marketers today associate this world-famous effect with going viral. Going viral used to be word-of-mouth in the pre-Internet age. And even in the Internet age, going viral wouldn’t happen without word of mouth. Whether someone tells their friends in person or on Facebook, it has the effect of even more people hearing about it.Messages that are particularly well-crafted spread like wildfire throughout the Internet. Specifically outstanding TV commercials are quoted and recognized everywhere. Who doesn’t know the Afflac duck? Who hasn’t heard “It’s only weird if it doesn’t work?” Or, 15 minutes could save you…well, you know. 4. Keep repeating your message. Repetition is king. Repetition makes your audience remember your message. It makes your message stand out. It brands your message with your audience. The more often you repeat a great message, the more it gets heard and the more people believe it, get on board with it, and help you spread it.King had a dream. He made sure to say it often enough to make that point perfectly clear. He used repetition for his message so well, that this is the most famous part of the entire speech. Repeating a message you believe in creates advocates for your cause and fans for your brand. Leverage the power of repetition to be successful. 5. Associate your message with a commonly used phrase to create an instant positive image. King associated his dream with the commonly known “American dream.” By using a related phrase everyone knew and associated with a positive image right in the beginning of his message, he created a positive association and a halo effect that mentally connected his message to a pleasant thought. This is a particularly good tactic when you anticipate your message to encounter resistance. Marketers today often use celebrities to create a halo effect, but they also use positive associations of any sort to make their message more positive and memorable. 6. Formulate clear, concise and simple sentences for a powerful impact. We’ve all learned how to write big. Communicating a message you want people to get right away, however, is all about being simple. Say what you want to say as quickly and clearly as you can. Use words everyone understands easily. Make your point and make it well. 7. Finish strong, with the most effective part of your message in the end. King’s speech didn’t just consist of the “I have a dream” part. There’s a whole long message before that part ever starts. Many of us have no idea what the rest of the speech is about, but we most certainly know that Martin Luther King Jr. had a dream.We know and remember it because this part of crafted to well, but also because it is purposefully put in the end, so that’s what people will remember.”I have a dream” is only succeeded by a hymn and the second world-famous part of the speech, “Free at last, free at last. Thank God Almighty, we are free at last” which, not incidentally, is also at the way end of the speech.The last thing your audience hears needs to be your strongest point, because if people remember anything, it’s usually the last thing you say. When we look back at King’s dreams, we can reasonably say that they have, indeed, come true. King would have seen his goals come true during his lifetime had he not been assassinated; but he would have spent a long time waiting and fighting to see them come to fruition. The higher your goals, the harder they are to reach. Marketers need to be aware of the fact that a timeline to reach goals needs to be reasonably adjusted to the impact the message has and the grade of difficulty the message bears. The importance of any marketing campaign is to create a following around it that will propel your message forward and make your goals come true. No message will work unless your audience believes it, is excited about it, and helps you spread it. When that happens, you will reach your goals. Outstanding post indeed, if I am not wrong so today every digital marketing company is focusing on these points and market their product. Those who provide custom video animation services they should implement these points on their plan so it definitely helps them a lot in terms of good sale. 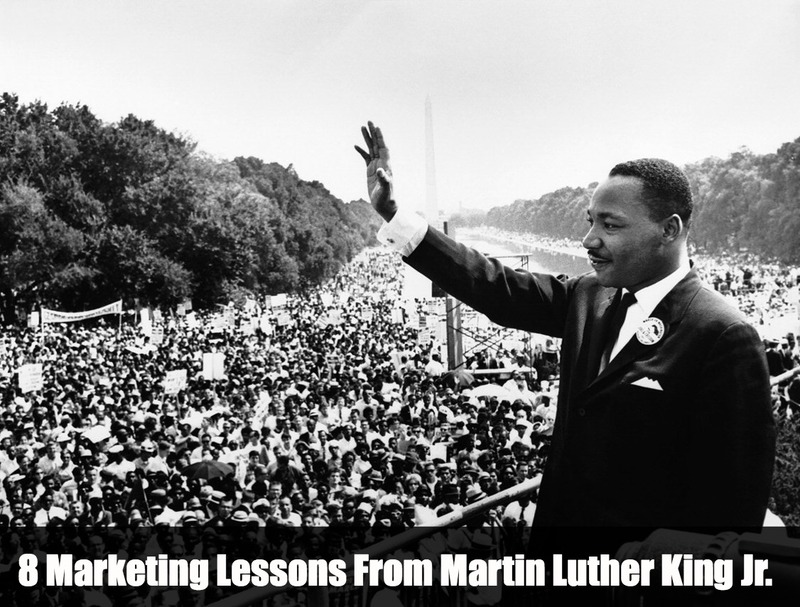 Martin Luther King Jr was my one of the most favorite Personality in the world I am a digital marketer and I think these tips would help a lot in my career. Really, Martin Luther King Jr is an amazing person. Thank you very much for your amazing article. Must say that I really enjoyed this post. MLK was one of the most influencial in history and after a good read one can see these points and should help a bunch.